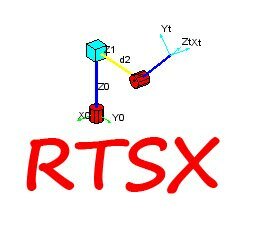 This is an official page for RTSX (Robotic Tools for Scilab/Xcos), an open-source software written in Scilab language to support robot analysis and control courses. The toolset is inspired by Robotic Toolbox for MATLAB/Simulink by P.I.Corke and share a similar set of core commands and functionality, though there are also differences in certain parts of the software. RTSX version 1.0 is now available for free download on RTSX download page, and it will remain free ’til its demise (or the developer ‘s, whichever comes first). To help you get started, the first three chapters of the e-book and command reference appendix “Robot Analysis and Control with Scilab and RTSX” are provided for free download. They are already included in the RTSX zip file under /doc/RACSR subdirectory. Robotic Toolbox for MATLAB/Simulink a superb work by Prof. P.I.Corke. I also highly recommend his textbook accompanying the software. Making Animation with Scilab by Sky Engineering Laboratory. I learnt about Scilab graphics and other interesting stuff from this website.